Laura Came from Scotland to Join SCULPTAFIT in Saint Johns? 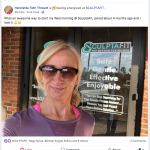 As fate would have it, she and her husband found themselves moving to Fleming Island, FL a bit before the Studio was set to open in June of 2016 – Of course, she was “over the moon” to realize she would be living only 30 minutes away from the SCULPTAFIT Studio and she made it a priority to get in as a “Founder Client” before we even opened the doors to the public. 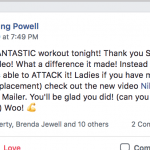 Laura reveals some eye-opening surprises on the video (such as menopause management) and also shares some of the critical keys that women need in a proper fitness program that delivers results in a gentle, fun and unique way. Essentially, her original challenges and current improvements highlight what most middle-aged women want, when it comes to their health and wellness. There is more that can be added to that list, as you are well aware. And that is what we specialize in here at SCULPTAFIT.